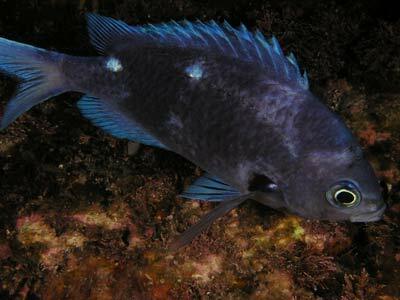 Michael McFadyen's Scuba Diving - Landing Bay Pinnacle, Poor Knights, NZ The western side of the Poor Knights Islands off the North Island of New Zealand has the majority of the sites that are dived most regularly. 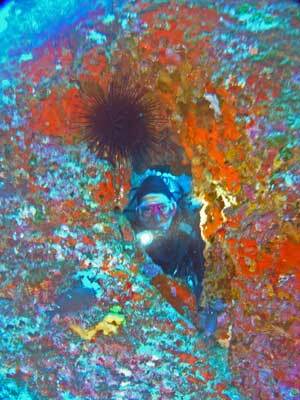 Maps of the islands with named dive sites show 60 separate dives, of which the majority are on the western side. 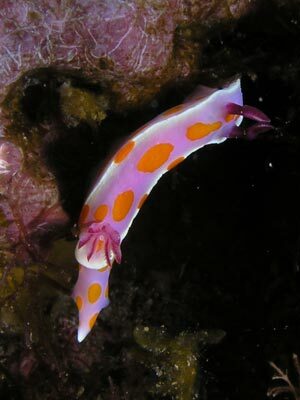 The south-western section of the northern of the two major islands, Tawhiti Rahi Island, has a series of four dive sites within a short distance. These are located in the few hundred metres running north from a bay. One of these is called Landing Bay Pinnacle. Landing Bay Pinnacle consists of a pinnacle that comes up from well over 40 metres to within five metres of the surface. The pinnacle is located perhaps 50 metres from the shear wall of the island. From the pinnacle a number of rides run out. One goes towards the east and the main island. Another runs north-west, there is one running west and another west-south-west (all these are rough directions). 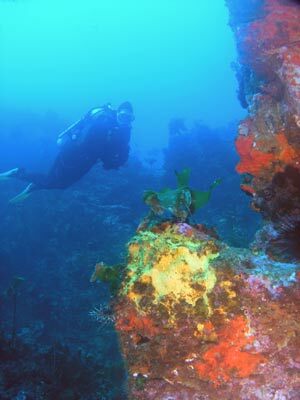 This site is quite close to Taravana Cave, one of the best dives I have done at the Poor Knights, but one I did not do on my March 2011 trip. 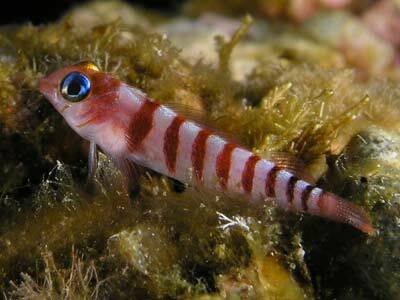 It is about 40 metres north of the cave and is definitely a separate dive site due to the depths. Landing Bay Pinnacle is located at GPS S35º 27' 56.5" E174º 44' 06.9" (using WGS84 as a datum) and this will put you on the top of the pinnacle itself. Once anchored, drop off the back of the boat and descend. Head towards the pinnacle. As soon as you see the pinnacle, turn right and follow the wall and then off on the first of the ridges. The depth drops off dramatically, and these ridges go deep than the one to the east and so should be dived first. The ridges have almost vertical drops off either side and you can explore these a bit before staying level and coming to the ridge top. You will not want to go right to the end of the ridge, but probably stop your descent and swim across to the next ridge which will be on your left. This ridge runs west, but may have a bit of north in it. Again, it drops off dramatically all around. It is a bit further between this ridge and the next one (you are moving in an anti-clockwise direction around the pinnacle) so you may need to ascend back up the ridge a bit before you can see across to the south-western one. Again, cross over once you can see it. These walls have some very nice growth on them. The colour is pretty amazing, yellows, reds, pins and purples make an amazing sight. From this ridge, follow the southern wall back towards the north-east and then east. You will then come to the eastern ridge. This is a lot shallower. It runs out almost level at about 16 metres at the pinnacle to about 14 metres at its end. In very good conditions you can see across to the main wall of the island which is about 25 metres away. However, unless you go straight over there at the start of the dive, it is a bit pointless as you will not have much time before you would have to return. Head back to the pinnacle itself and start a gradual ascent. You are probably now a bit low on bottom time and air, so you need to start getting shallower. On my dive we had completed about 35 minutes by now. On the way up, circle the pinnacle and look in all the holes. 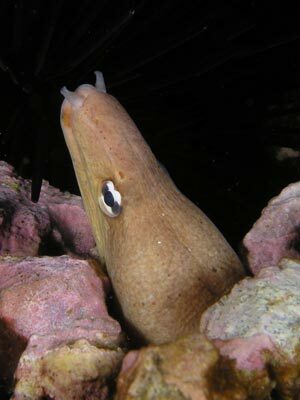 There is a lot of kelp in the shallower sections, but there are lots of eels and nudibranchs to see. 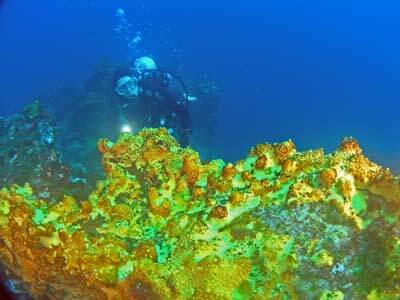 A nice easy ascent will keep you out of decompression and let you enjoy the top of the reef. 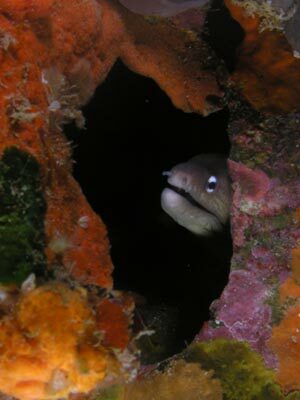 During this dive you will also see lots of fish. Off the ridges there are schools of snapper and two-spot demoiselles, with kingfish coming in for a look. 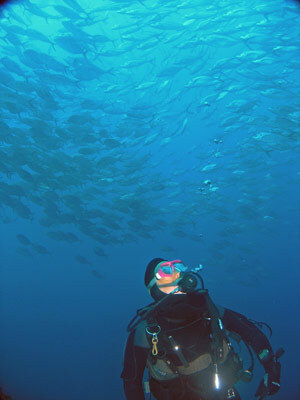 There are also large schools of trevally. When you get to the top of the pinnacle, do a long safety stop before swimming over to the back of the boat. You should be able to get a total bottom time of at least 45 to 50 minutes, we did 55 minutes. Visibility was about 25 metres and we had a water temperature of 22ºC. 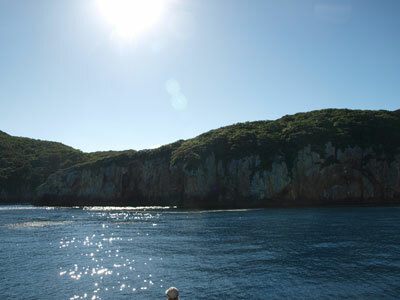 This is yet another very good Poor Knights Islands dive site, with lots of fish and a very colourful reef.